If it's possible for a movie to be agressively bland, Race to Witch Mountain is that movie. 98 min. Buena Vista Pictures Distribution. Director: Andy Fickman. Cast: Dwayne 'The Rock' Johnson, Ciaran Hinds, AnnaSophia Robb, Alexander Ludwig, Carla Gugino. If it's possible for a movie to be agressively bland, Race to Witch Mountain is that movie. You're liable to forget it even before you've finished watching it, so why bother? Its sole purpose seems to be to waste 100 minutes of your kids' time, but as video babysitters go, they and you can do much better than this Bruckheimer-for-kids adventure, a reboot of the wan Disney franchise best known for 1975's Escape to Witch Mountain and 1978's Return from Witch Mountain. Loosely based on the book by Alexander Key that started it all, Race to Witch Mountain casts the Rock as Jack Bruno, Las Vegas cab driver and convicted felon. When he gets a fare from two Star Wars stormtroopers, we learn that the UFO Space Expo is in town. It's a good excuse for a Las Vegas cab driver and convicted felon to get to know outer-space expert Dr. Alex Friedman (Carla Gugino), who he chauffeurs to her thankless job of being heckled off the lecture stage by UFO conspiracy nuts oddly unwilling to hear any science. Meanwhile, Jack's moved on to another fare: two apparent teens named Sara (AnnaSophia Robb) and Seth (Alexander Ludwig). No such luck: they're actually superpowered EBEs (Extraterrestrial Biological Entities) on a mission to save their world and ours, if they can only elude a Siphon (space assassin) and the government suits led by ruthless Major Henry Burke (Ciarán Hinds), who has their spaceship in the super-secret government installation at Witch Mountain. Mayhem levels increase steadily until the inevitable showdown at the big ol' rock with the funny name. Pretty much the best that can be said for Race to Witch Mountain is that the flying saucer is really cool looking. There's quite a bit of badly staged and edited action, but no real excitement. The Rock brings some charisma to counteract the alien kids, who are designed to have none (the naturally blank Ludwig excels in this area). As a reminder of what comic energy looks like, Garry Marshall shows up as a scientist in a Winnebago, but he's the exception to the rule that this movie mercilessly wastes actors in pastepudding bland roles: Gugino, Tom Everett Scott, Chris Marquette, and Cheech Marin must've had to mumble their salary as a mantra to get through with this insistently uninteresting material. Even sought-after creature designers Alec Gillis and Tom Woodruff, Jr. couldn't be bothered to come up with anything memorable. The franchise's original child stars (Kim Richards and Ike Eisenmann) show up in cameos. Let's hope Robb and Ludwig never have to perform the same function. 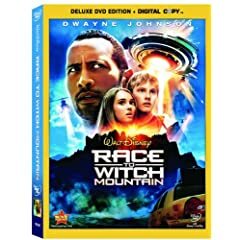 Disney's Blu-ray + DVD + Digital Copy edition of Race to Witch Mountain is technically impressive. The A/V transfer is state-of-the-art, accurately bottling the movie's colorful, weird look in a spotless picture. Nighttime scenes and those with special effects look as strange as they did on screen, but never lose any detail, and contrast is solid. The DTS-HD Master Audio 5.1 mix is a powerhouse, with plenty of activity all around the surround channels, well-calibrated balance, and a dynamism that's quite strong for a mid-range kid's picture. This special edition includes a handful of bonus features. Eight "Deleted Scenes" (23:21 with "Play All" option, SD) come with introductions by director Andy Fickman, and there's a reel of "Bloopers" (3:37, SD). In "Which Mountain?" (8:20, HD) Fickman reveals the references to the original Witch Mountain movies, homages to Disney, and cameos peppered into his movie. Also adding value are that bonus DVD copy and a third disc that holds a Digital Copy for yet more portable playback. All site content © 2000-2019 Peter Canavese. Page generated at 04/20/2019 03:42:56PM.